Why Choose Us for Wood Staining? They don’t communicate well that stains can be very tricky to pick when it comes to colors and how they look different on different surfaces. They use only high pressure washing to prep wood siding which can damage the cedar, fir, or redwood surface. They don’t mask the surrounding well and so stain ends up on walkways, windows, and landscaping. They often have little experience with the various products on the market. We offer free stain color consulting and testing to help home owner find the right color. We use a 2 step wood stain remover and wood brightener that doesn’t damage the wood and more effectively preps the wood surface on exterior siding. We carefully mask around our work to protect your home, landscaping, and valuables. We offer expert advice on the different stains and clear coats on the market and which one will suit you best. Stained wood as an accent inside or outside a painted house can add a warm touch to your home. Whether it’s used on a pergola, a trellis, corbels, a wood front door, a stained handrail, kitchen cabinets, or built-in cabinetry throughout the home, this design feature makes a home stand out in a neighborhood. Spray ‘n Coat offers both interior and exterior wood staining. While these services may sound similar, they require very different products and techniques. Exterior staining is done to add color and protection from water and the sun in order to preserve the wood elements of your home. These stains provide color and protection in 1-2 coats of the same exterior wood stain. 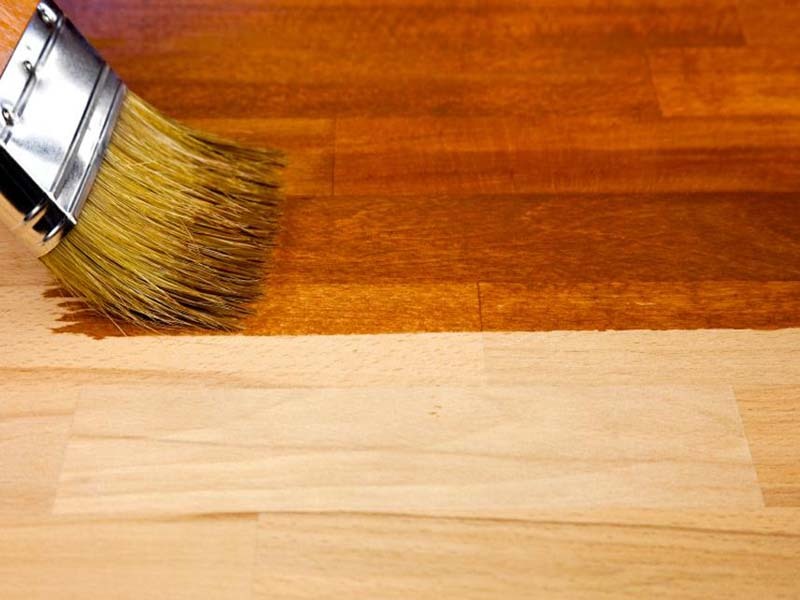 properly prepared, we apply the wood stain with either a sprayer or a brush and roller, depending on the situation and surface material. In most cases the wood stain is applied to the point of rejection; we apply it until the wood is fully penetrated. Most wood stains are not designed to build up a thick film, but instead are designed to penetrate into the wood. However, some solid body stains are designed to be applied more like paint and do build a small film thickness on top of the wood and provide a solid color finish instead of the more traditional semi-transparent finish. Exterior wood stains come in a range of colors but also in various transparencies. This includes clear or transparent, semi-transparent, semi-solid and solid. Some stains we use for exterior wood staining even come in a satin or semi-gloss finish for unique projects. Interior wood staining is also done to add color, but in most cases relies on a clear coat for the protection, such as lacquers, polyurethanes, polyacrylics or water-based clear coats to create a durable and beautiful sheen and protective layer on top of the wood stain. For example, kitchen cabinets, stair handrails, wood windows, wood-stained baseboards and window and door trims typically are all stained to simply add color to the wood and then given a clear coat for the finish. Spray ‘n Coat has a unique resume of both interior and exterior wood staining and we would love to help add a unique style to your home by staining wood inside or outside your home. Request a free quote to learn more about our wood staining process.